I have a new side dish recipe for you that is so easy to make and is soooo delish. These Szechuan style roasted mushrooms are 100% going to be the star of your next meal. My first thought when creating this recipe was to skewer them and grill them on the barbecue. Then Steve reminded me that it was minus 100 Celsius outside so grillin’ was not an option. Duh. Second thought? Why not just pop these into the oven and roast them? Gawd, I’m so brilliant (occasionally). Do you know how long it took to prepare the sauce for these? Under two minutes. NO wait. I think it was more like under a minute. You can’t ask for anything better, right? I’m a big fan of roasting veggies, especially asparagus, brussel sprouts, carrots, cauliflower. Baking really brings out their fantastic flavors and textures. 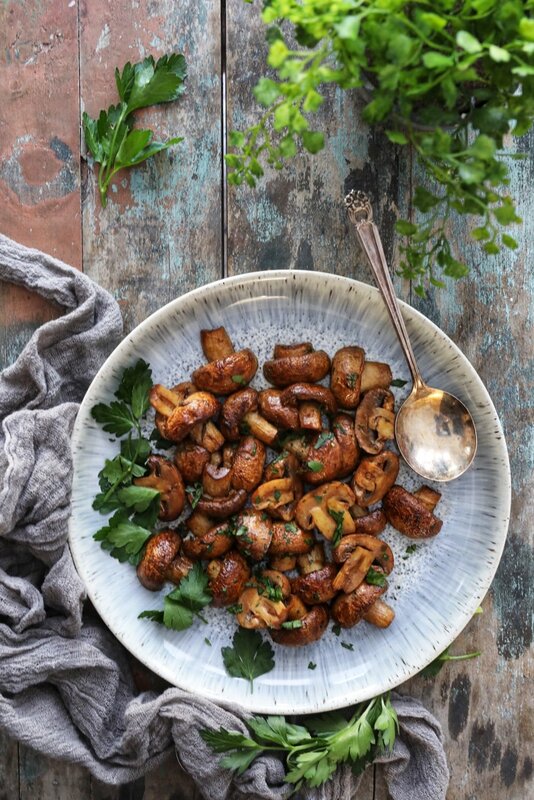 These mushrooms have a rich savory taste, thanks to the addition of balsamic vinegar, soy sauce, oyster sauce and that beautiful kick of chili oil. You can make this recipe as a sumptuous side dish for just two people or if you’re feeding a crowd it’s a no muss or fuss accompaniment that is perfect for just about any main course. Now, truth be told. I’m not a big mushroom fan. Surprised? Well, I just prefer other vegetables. And speaking of which, did you also know that mushrooms are NOT a vegetable? In fact, they are neither a fruit nor a vegetable – they are a TYPE of fungus – a notion that puts me off for sure. Is there out there that finds the word “FUNGUS” appetizing? Didn’t think so. I have always thought that just because it’s green, it has to be healthy. WRONG. 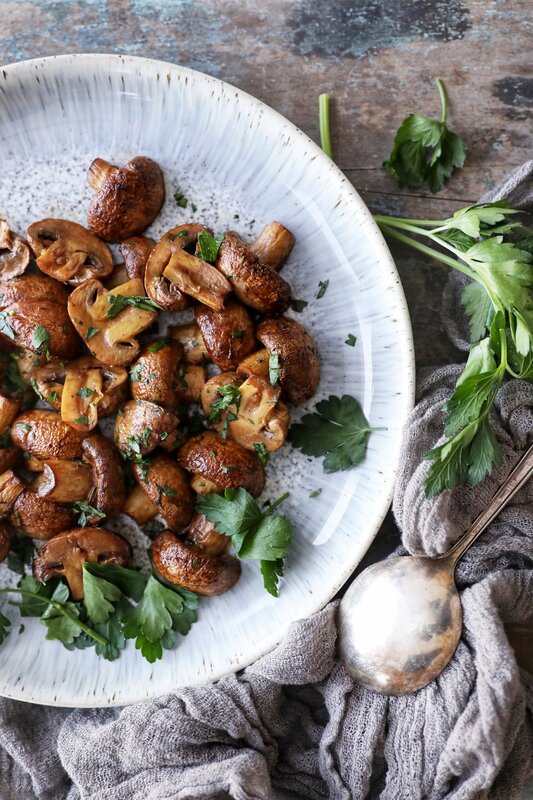 Did you know that mushrooms are super healthy for you? I would never have guessed. Mushrooms are packed with nutritional value. They’re low in calories, are great sources of fiber and protein. They also provide many important nutrients, including B vitamins, selenium, potassium, copper, and (particularly when exposed to the sun) vitamin D.
So go ahead and roast up these beauties and don’t be put freaked out by the fact that they are actually grown in POOP. Yes, you heard me. Perhaps that’s why I have never been drawn to them. Just looking at the way these turned out has convinced me not to think about anything else except they are totally amazing. I think I’m going to be making these roasted mushrooms almost every week now. Enjoy! 2. Toss mushrooms with all ingredients in a bowl. Arrange on a baking sheet and roast in oven for 20 -25 minutes or until mushrooms are tender, golden brown and glazed. Turn the mushrooms halfway through the baking process.